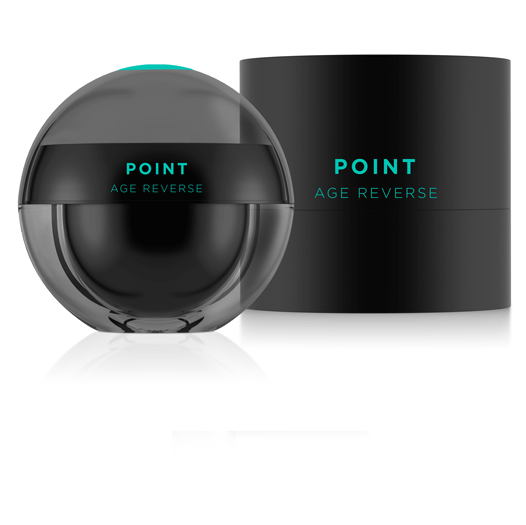 POINT AGE REVERSE is infused with a cocktail of peptides and botanical ingredients to help reduce visible signs of skin ageing and promote skin firmness and elasticity.• Reverse visible signs of ageing. Peptide complex - An innovating combination of 4 peptides namely, Palmitoyl Tripeptide-1, Palmitoyl Hexapeptide-12, Palmitoyl Pentapeptide-4 and Palmitoyl Tetrapeptide-7 with powerful action that stimulates the synthesis of the key constituents of the skin matrix, improving skin healing and turnover process, reducing inflammation and retaining skin elasticity. Contains proteins, glycoproteins and polysaccharides isolated from soybeans. By stimulating synthesis of extracellular matrix constituents and providing comprehensive photoprotection, Phytosan counteracts the signs of biological and UV-induced premature skin ageing (such as the formation of wrinkles). It is a concentrate obtained from the fertile bases of the alga Undaria pinnatifida. Reactivates genes linked to the synthesis, the maturation and the organisation of collagen fibres, elastin fibers and hyaluronic acid, implicated in the redensification of the extra-cellular matrix of the dermis for a rejuvenating effect.